Canadian marketing companies garnered a number of wins at the 17th annual Webby Awards this year, scoring nods for their work in advertising, public service and activism. The Webby Awards, which honour Internet creativity, named Tribal DDB Toronto, Richmond Hill’s The Uncultured Project, and Vancouver’s Yulu Communications and MetaLab as winners for their online advertising work, the Webbys announced April 30. Last June, Tribal DDB Toronto set up an online campaign for McDonald’s called “Our food. 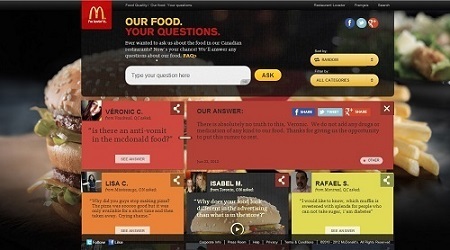 Your questions.” It allows Canadians to type in 140-character questions about food quality, ingredients and menu items at the fast food super-chain. The questions are then answered with either text or video. McDonald’s Canada later featured “Our food. Your questions” as an ad during the Canadian broadcast of the 2013 Super Bowl. The Webby Awards honour Web sites, interactive advertising and media, online film and video, mobile apps and social media. Winners are chosen by the International Academy of Digital Arts and Sciences, which includes Twitter co-founder Biz Stone, Instagram CEO Kevin Systrom and Huffington Post editor-in-chief Arianna Huffington. This year, the awards received over 11,000 entries from more than 60 different countries. The ceremony will be streamed online from New York City at www.watch.webbyawards.com, starting at 9 a.m. ET on May 22. This year’s host will be comedian Patton Oswalt, who has appeared on Comedy Central, “Late Night with Conan O’Brien,” and most recently, The Newsroom, a drama from HBO.